In 1941 work started on Maserati's first road car, which eventually resulted in the 1500 Gran Turismo, known internally as the Tipo A6. This change in strategy was instigated by the company's new owners, the Orsi family, who realised there was no viable future for Maserati as a specialist racing car manufacturer. Launched in 1946, the 1500 Gran Turismo was a reasonable success with 61 examples built over a five year period. It was replaced by a two-litre version (Tipo A6G), which failed to attract the same level of interest for a variety of reasons. After a three year hiatus, Maserati returned to the road car market with a heavily revised version of the 2000 Gran Turismo built in small numbers in 1950 and 1951. Known internally as the Tipo A6G54, the new road car retained its official type-name 2000 Gran Turismo. The prototype of the grand tourer was launched at the Paris Motor Show in the fall of 1954. Clothed by Frua with a spectacular coupe body, finished in white, the show car combined an earlier competition chassis with the all-new Tipo A6G54 engine developed specifically for the new road car. The Tipo A6G54 two-litre straight six was constructed entirely from aluminium and featured wet-sump lubrication. The single biggest improvement compared to the earlier road car engines was the use of a twin-cam head. This resulted in a very welcome hike in power to 150 bhp from the Tipo A6G's modest 100 bhp. The two camshafts were driven by chains, which was a much simpler solution than the gears used on the competition version of the engine. Like most Maserati engines of the day, the Tipo A6G54 was available with, optional and later standard, twin-spark ignition. Built by specialists Gilco, the chassis was of a very conventional tubular design almost identical to the earlier Tipo A6G. The front suspension consisted of double wishbones and coil springs, while at the rear-end consisted of a live axle and leaf springs. Houdaille shock absorbers were used on all four corners. Aluminium drum brakes provided the stopping power. The rolling chassis was completed with a four-speed gearbox. 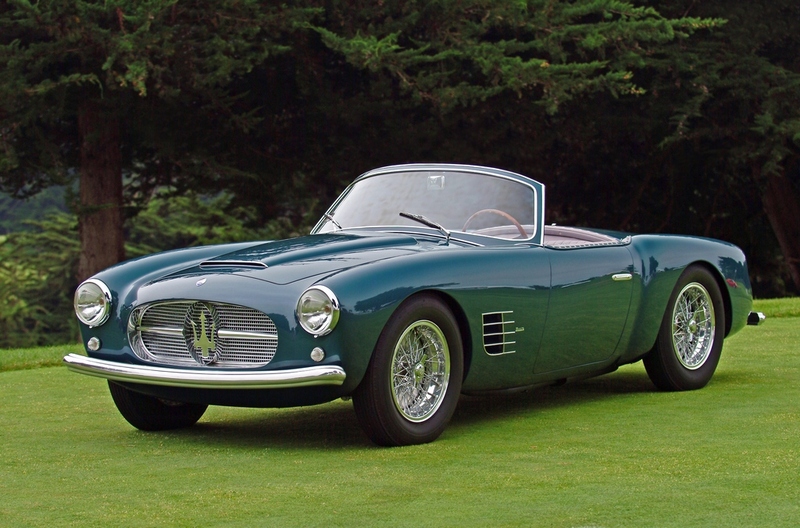 Maserati's original coach-builder of choice, Pinin Farina, was now working almost exclusively for rival Ferrari but Allemano, Frua and Zagato all proved to be great alternatives. Allemano was responsible for an understated 2+2 coupe, Frua predominantly supplied spider bodies and Zagato offered competition inspired coupe bodies. The drastic changes greatly improved the Maserati A6's appeal and no fewer than sixty examples rolled off the 'production' line between 1955 and 1957. The third evolution also turned out to be the final for the Tipo A6; in 1957 it was replaced by the all-new 3500 GT. Whereas the A6 was built in relatively small numbers, the 3500 GT marked Maserati's switch to mass production. As a result the A6G54 remains as the last of the hand-built sports cars built by the Italian manufacturer. Particularly the Zagato bodied examples are highly sought after today.